Our garden right now can be described as a Twitchers Paradise! 'Not the greatest apple I've ever eaten, but beggars can't be choosers, even one so pretty as me'. 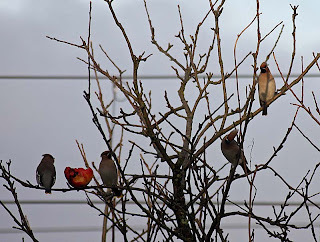 The waxwings came back. Beautiful. We do look forward to them visiting us, this being the third year now. I love waxwings! They come here in winter. And they are really beautiful! Oh you are so lucky, they are such beautiful birds. 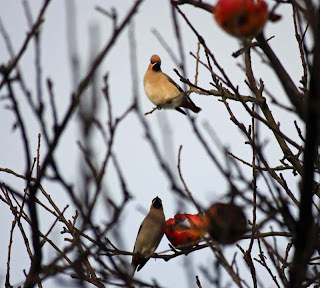 We had fieldfares here one year which was quite exciting, but not as exciting as you waxwings. Oh, I love these pictures! Thanks. They certainly are beautiful. 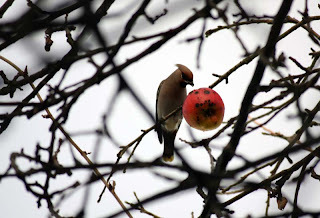 My first introduction to them was three years ago when they visited the apple tree in the garden. Since then, every winter they come (providing there are apples in the tree). I know - we are lucky to gaze upon them so close. Shame the trains keep passing by as it scares them all away, then they come back settle for a few minutes and are scared away again. 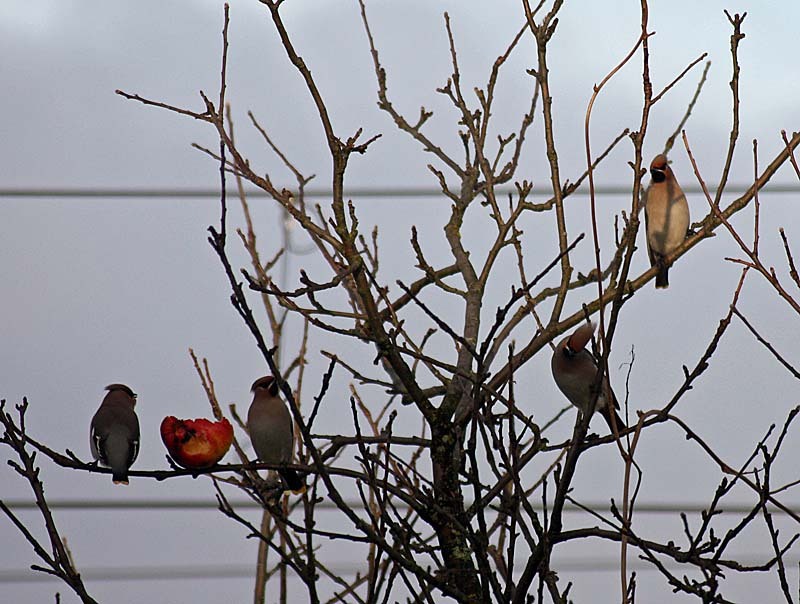 We have a couple of regular fieldfairs too who are not too happy sharing their apple tree with other birds. That apple tree has been good for us and for the birdies. All taken by my husband when he was out in the garden. Oh now I am very jealous - I've never seen them - they came through here (Orkney - frozen north of scotland) earlier maybe a month ago - probably on the way to your apple tree - infact I'm sure thats what they were twittering on about! NOt alot in the way of that kind of tree up here!!! 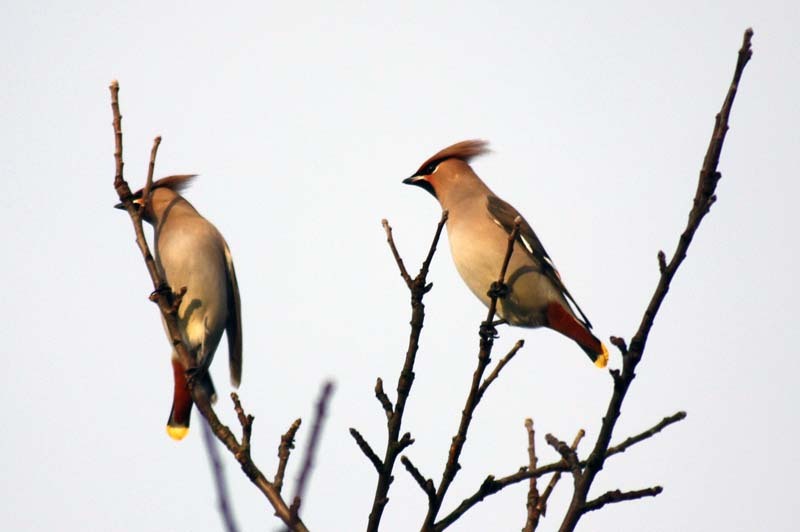 We get field fares and Redwings, Twite, Reed buntings, linnet, greenfinches and siskin (gorgeous)but not alot in the way of very wonderful waxwings! What wonderful photos - clever Mr Mangocheeks. OK, this time next year - can you set up some deck chairs..........? Those are wonderful photos, kudos to your husband! They're such beautiful birds, and were my bird-loving grandmother's favorite. We've never seen any at our house (though they're supposed to live in our area), so it was a real treat to see them in your photos! 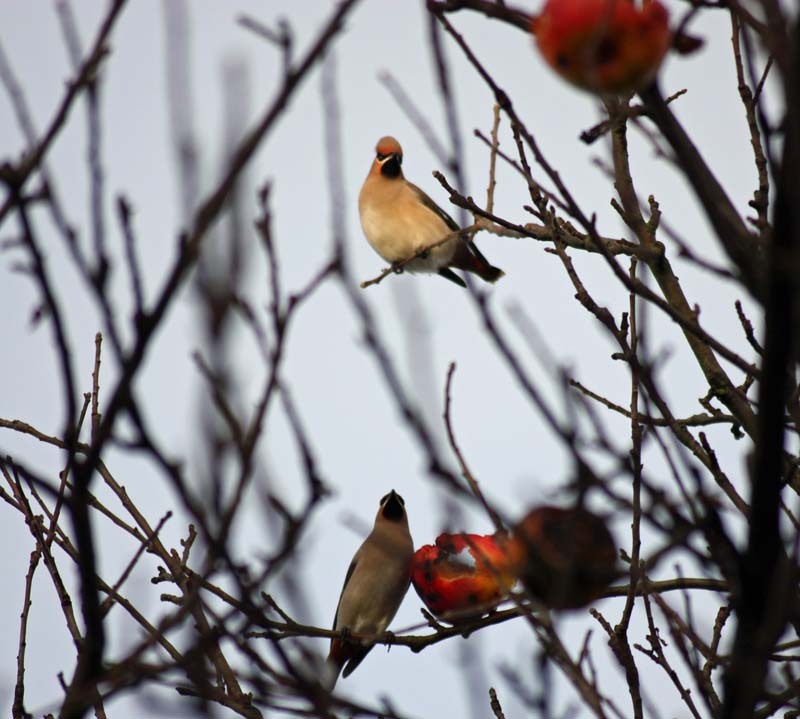 How lovely to have those gorgeous waxwings as regular visitors. Thanks to your apple tree for enticing them in. Happy twitching and thanks for sharing those lovely pics. Yeph I think your right they were on there way to my apple tree from frozen north of scotland to frozen west of scotland. It does sound like you get a variety of birds where you are. I don't think i've ever seen Redwings, Twite and linnet. I'd be happy to set up some deck chairs, but if the weather is anything liek this next year, they will be hiding deep under the snow. Your bird-loving grandmother would enjoy looking out of our flat window today, they are just feasting on last of the apples! Thanks to our apple tree, we have been blessed the past few years with their wonderful visits. I adore them, they made my day, thanks for sharing the photos!! What lovely birds! Blessings this advent! BBbbbbbrrrrr it certainly it is. Stunning birds, what a gorgeous sight. They certainly are and I have been spoiled all day looking at them. We certainly are. Need to peek outside the window today and see if they return. We have thrushes and blackbirds too, but woodpeckers. we have only ever seen once here. Made us smile at how brave it was as our garden literally backs up against train links. Thank you so much Lola. Its Rainbow Swiss Chard in my header. woww!! they look so adorable.. we do have a similar type visiting our garden during winter months.. i keep watching them for hours on end! They certainly have been entertaining and lovely to watch. Sweet birdlets! I get all melty over birds and cats particularly. :) Your comment made me smile. Cats and birds together - not always a good combo.